Our lives are changing, we have less time and we want to enjoy what is left of our busy lives. We are concerned with safety and we care about using too much water and fertiliser. In short, we want a lawn with low maintenance, helping us save time, money and the environment. No mowing, watering or fertilising. In a country where water is a scarce resource, artificial lawn makes all that more sense. You pay for quality. Heynsturf has a suitable artificial grass product for your specific need and they are all priced differently. Depending on what type of installation you require, the installation costs will change. Our turf prices are market related and you will even find them competitive. We can provide a quote once we have inspected the installation area. It costs more initially than natural grass, but over the lifetime of the grass you save money and most of all, it saves time and it saves hassles! Synthetic lawns SAVE WATER AND MUNICIPAL CHARGES. 3. Is artificial grass safe for my children? 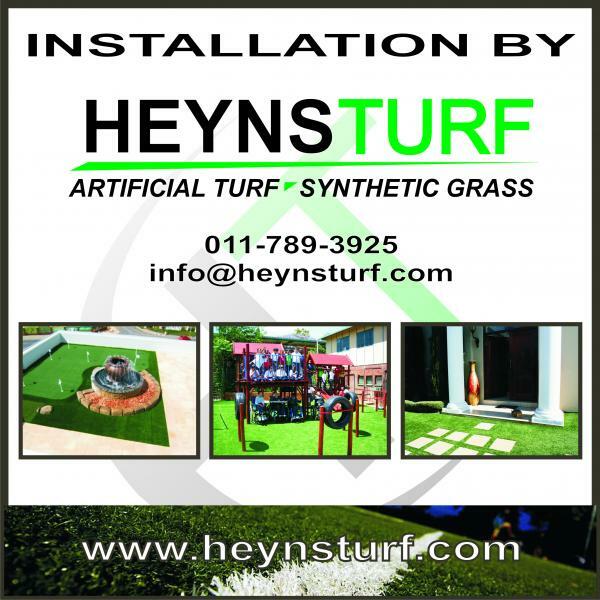 Our business started because Solly Heyns installed synthetic grass at his wife's upmarket nursery school. Solly and Diane would definitely not put the most prised possessions of parents at any risk. The synthetic grass is perfectly safe for children. To put your mind really at ease you can install a rubber shock pad underneath the surface of the turf if you are concerned about the shock absorption, but our nursery school clients have not had any problems. Garden Grass natural and FT 40 slide both are sand infill systems and provide good shock absorption. 4. Would my pets harm the grass? The feedback from our clients are that pets love the artificial lawn. We have not heard of any pets harming the artificial grass, but if it does happen, you simply replace the damaged section by cutting it out with a Stanley knife and fitting the new piece of synthetic grass. 5. What sort of sub base must be used? We normally use crushed stone or concrete. Crushed stone assists with drainage. River sand compacted is also an option, although we do not have much faith in it's longevity.Concrete surfaces are very hardy and easy to lay down, especially around houses and security complexes. Take care when having your sub base installed. Use experienced installers such as Heynsturf, to validate your guarantee. 6. Can I install synthetic grass on top of my existing lawn? Landscapers have various opinions on this matter. We prefer to remove the grass and spray the cleared surface with a weed killer. We then prepare a strong sub base. Natural grass left underneath the synthetic grass cover will eventually die causing the surface to become uneven. This will result in your synthetic lawn making "bubbles" in places and becoming uneven. In the event of grass starting to grow under the synthetic grass covering, you are presented with a unnecessary problem. Why would you want that? 7. How does our artificial grass handle water? The artificial grass has been designed for water to drain through it. That is why it is necessary to ensure proper drainage when the sub base is installed. Our Heynsturf installers have been trained to offer you advice to ensure that drainage issues are sorted out. 8. How long will our synthetic grass last? This will depend on the type of grass you install, your sub base and the care you take. Recently some cheap turf with suspect quality has hit our markets. Most will not last long. You get the quality you pay for. Always ask about warranties. If the warranty is issued by an individual operator and it is not backed up by a reputable company, you should be sceptical. Ask us about our warranties. How will you care and utilise your lawn? Sport fields properly cared for can last for over 8 years. Your home lawn is very unlikely to be used as much as a sports field so it should last for much longer. 9. Why do synthetic grass and turf products cost so much? Why should I not go for cheaper products? The original producers of yarn and manufacturers of artificial turf and artificial grass products used the best material and high specs. A good product has a high quality backing, is dense enough and weights more than cheap products. This ensures that the product lasts for many years. Pick up a sample and test it for weight, check out the latex backing, does it go flat when you step on it, is it hard to the touch, is it made from good yarn and what guarantees are provided and by whom? Nowadays new manufacturers are using inferior yarns, lower specs and cheap tufting machines. If you are willing to settle for a product with virtually no guarantees that will last around a year, by all means buy it cheaper. However, if you care about your home, office or school as an investment, our advice is not to go cheap. Very important. Who provide these? Are the guarantees backed up by reputable companies or is it the owner of a small company and a new kid on the block providing the guarantees? Beware of a 10 year guarantee on a cheap product, provided by the owner with no official backing of a reputable company.